With only a matter of weeks until Christmas - 'tis the season to start preparing for Christmas campaigns. You didn't read that wrong. With December being the most lucrative time of the year for most retail businesses, you really can't start planning your Christmas marketing campaign too early. With online shopping continuing to grow in popularity year after year, it's a great time to take advantage of the increase in sales during the holiday period. One way to do this is by utilising your brand's social media accounts. Social media is a great way to communicate with your customers on a personal level, and there's no better time to do this than the Christmas period. With more people home from work and enjoying their downtime, inevitably, there is also an increase in social media traffic. So with that in mind, we have some tips on how to make your social media more festive this season. If you want to take advantage of the Christmas holiday period you have to be willing to get involved. This is where starting early can pay off as you can prepare your Christmas campaign and the content to go with it. You'll see most brands make their social media particularly festive, with many changing to Christmas profile and cover pictures which show off their offers and holiday spirit. Some will also use hashtags to get their customers ready for the season such as Coca Cola's iconic #HolidaysAreComing. This reminds customers that the holiday is approaching and to keep shopping in mind. It's not uncommon for non-retail brands to get into the spirit too and this is a good thing because in an online sea of holiday joy your business can look like a bit like a social Scrooge if you choose to ignore Christmas. Keep it fun and consistent so people can recognise your posts and engage with them. With the high saturation of Christmas posts over social media, it can be easy to get lost amongst them. Whatever your marketing strategy is this Christmas, it's important to share it across your social platforms. This isn't exclusive to online offers either, whether it's a TV advert or an in-store exclusive social media is a fantastic way to get noticed. John Lewis is an expert for this, their highly anticipated advert doesn't just end on the TV screen, they know exactly how to use their other platforms to get extra exposure. Their 2016 campaign #BusterTheBoxer was seen all over their social media, with the playful pooch even getting his own Snapchat filter. Even if you didn't see the advert on TV or Youtube (although we find that hard to believe), you undoubtedly saw it across social media. Promoting your Christmas campaign across social media platforms is a great way to extend your reach to as many people as possible. For most, Christmas is a time to think about others and businesses should keep this in mind throughout their marketing campaigns. Social media is a great way to communicate with consumers on a more personal level, and it's a great way to remind them how much you appreciate their custom. A good way to do this on social media is to promote special offers to customers, such as free shipping days or discount codes. Using social media to do this allows people to recognise how following your online activity is a great way to gain benefits and hear about your offers first. It's also the perfect time to put the face behind the brand on show. If you want to connect with people via social media it is a good idea to show that you are people too. 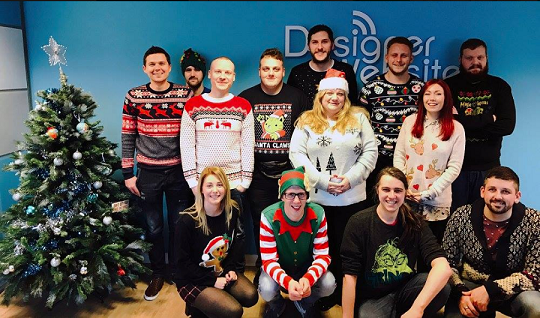 This personal touch doesn't have to be too invasive - sharing a "Christmas Jumper Day" or a picture of festive decorations is a nice way to remind customers that you aren't all serious business all of the time. Try to schedule posts on your social media wishing your customers a Merry Christmas too - many use social media as a way to wish their friends and family love over the holidays, so it's always nice to add that personal message from your brand too. If you want any help with your online Christmas campaign this year our expert team is here to help. Visit our contact us page below to see how we can help you make your brand more festive this year.